Romantic studio log cabin designed with couples in mind. This honeymoon cabin offers a heart shaped Jacuzzi inside with a very inviting hot tub on the private patio. There is a fully equipped kitchen for breakfast in bed or a romantic dinner in front of the fireplace. 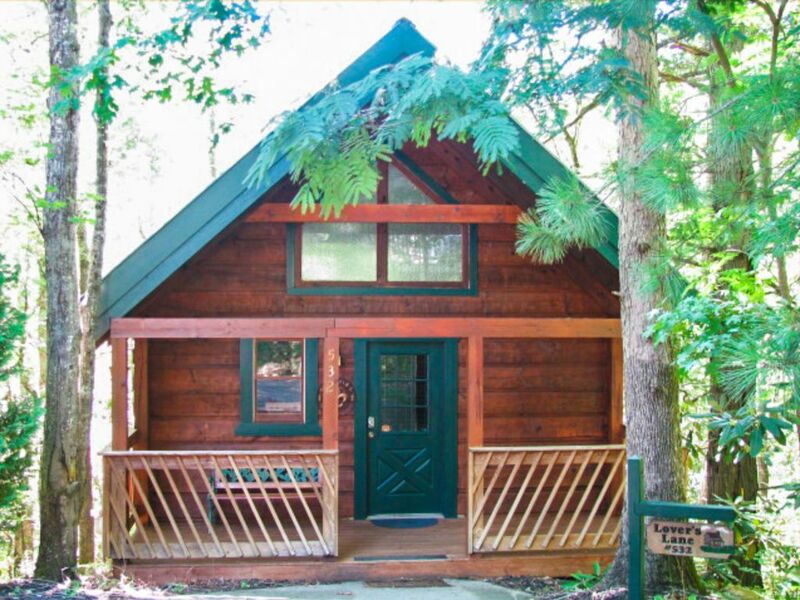 Located in Mountain Shadow Resort, you are 3 miles from Downtown Gatlinburg. There is a trolley stop located near by to bring you to Downtown Gatlinburg, the Arts and Craft Community and Pigeon Forge. Guests of Lover's Lane also have access to the resort swimming pool. For our 1st anniversary I couldn't have picked a better cabin. Upon arrival, the cabin was in immaculate condition. It was so clean and cozy. My wife was really impressed. Everything in the cabin worked just fine...plenty of hot water for those long bubble baths in the heart shaped jacuzzi. I will most definitely return to lovers lane cabin. Thanks Michelle for a wonderful stay! Very nice and clean cabin! Spent the weekend with my wife for her birthday. Perfect for a couple. Everything was in order and worked with no issues. Well kept and clean! It is in a community but at the end of a cul de sac so doesn’t seem like you are that close to others. Can be a little noisy because of road that is somewhat viewable from back deck but is covered pretty good by trees. Overall we really liked this cabin and is close to downtown Gatlinburg. Would definitely stay again! Thank you for your stay. I am glad you enjoyed your time in Gatlinburg and at Lover's Lane. Our stay at Lover’s Lane was overall really great! The cabin was SO CLEAN and well stocked with everything we needed! Only downfall to the cabin was it being kind of close to a road so you could kind of hear traffic. One other thing was that the neighboring cabins were really loud at 1:30 in the morning. BUT everything else about the cabin really outweighed these two things and we couldn’t have asked for a better stay, especially for the great price! It was secluded but also so close to Gatlinburg! Also, the hot tub was awesome! It was a fantastic way to relax and end an awesome day in Gatlinburg! Would definitely stay again! Thank you for your stay. I am glad you found everything with the cabin as it should be. I am sorry you had problems with neighboring cabins. The resort does have quiet hours and we are currently working with the Gatlinburg Police Department on the correct procedures for dealing with loud guests. Thank you for the information. Welcome back! I'm glad you enjoyed your stay again. Upon arrival the cabin was extremely clean and cozy. You can tell cleanliness is high on the priority list. The room is perfect for a couple with an amazing heart shaped jacuzzi in the room, the fireplace really sets the mood and there is a nice TV to enjoy while you relax. The heart shaped hot tub is huge, definitely perfect for two adults. On the patio, there is an extremely nice hot tub, which was clean and hot about an hour after our arrival. While the cabin is surrounded by other cabins, it is hard to tell. It is very private. The patio is situated perfectly to give you a secluded night of relaxation in the hot tub. In addition, the location is perfect, it is only about 5-7 minutes to downtown Gatlinburg and theres a good city about 2 mini away. My only regret is that it was already booked for the next night because one night in this couples haven isn’t enough. Thank you for your stay. To be clean and cozy is high on my priority list. Thank you for your kind words and we hope to see you soon. Thank you for your stay. I am happy to hear you enjoyed your stay. Cancellation Policy: 0% if cancelled less than 30 days before arrival date. 50% refund if canceled at least 30 days before arrival date. 100% refund if canceled at least 60 days before arrival date.